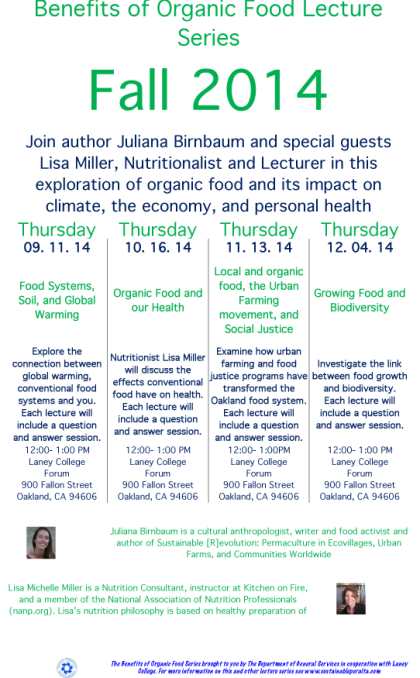 Please join the Sustainability Committee at our first in a series of lectures that opens the discussion about organic food and its impact on climate, the economy and personal health. Our first in the series will be delivered by Juiana Birnbaum. 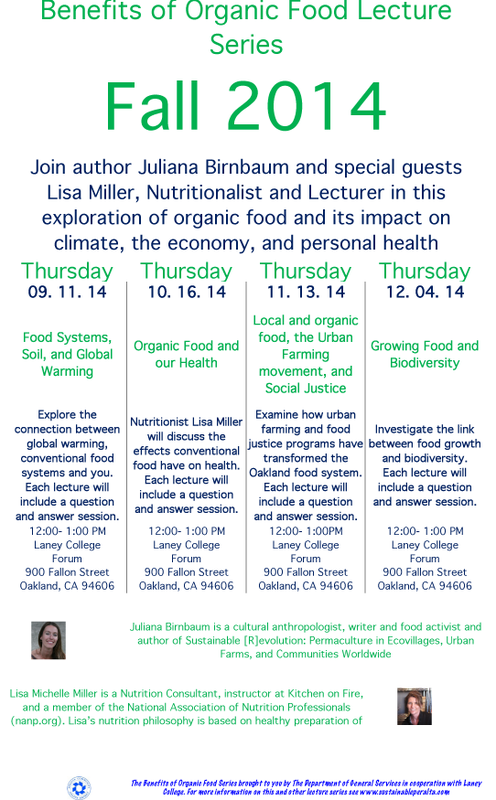 This lecture will discuss the connection between global warming, convental food systems and the consumer-you! This is a wonderful opportunity for students to gain insight into how their food is sourced. We are often asked how to help our community learn to make better food choices for a variety of reasons. The lecture will be at Laney College, in the Forum from 12:00 to 1:00 p.m. All are welcome to come. The June 12 meeting started off with the swearing in of our new Student Trustees Sharon Clegg and Brian Cervantes. Next up, a Study Session on Financial Aid, and then a presentation on the Laney Sustainability Center. The Board presented a proclamation honoring Congresswoman Barbara Lee for her continued support of the Peralta Colleges. The Board received a check for their participation in the Oakland Shines program and heard of the 2012 – 2013 Tentative Budget. Lastly, the Board announced the finalization of the contract for Peralta’s new Chancellor, Dr. Jose Ortiz. Peralta Community College District is comprised of Berkeley City College, College of Alameda, Laney College, and Merritt College. Together they provide northern Alameda County a range of educational programs and life-long learning opportunities.